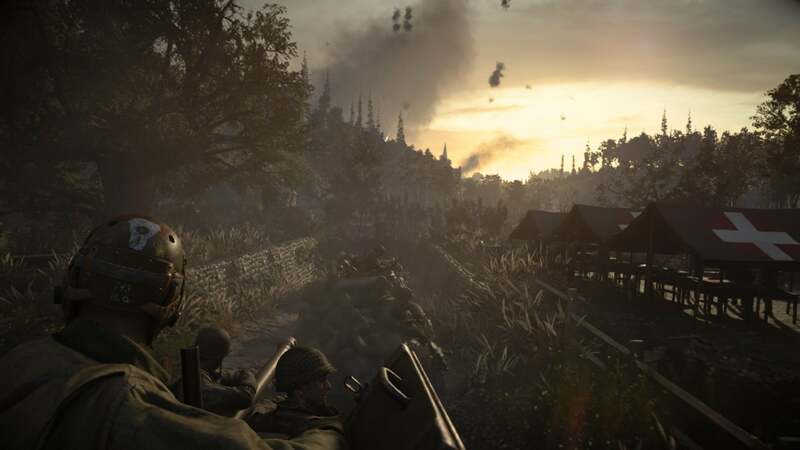 Call of Duty: WWII isn’t a remaster, but it feels like one. As the gate crashed open on my landing craft and I sprinted desperately onto Omaha Beach, I half-expected to hear people yelling for Lieutenant Powell, star of 2002’s Medal of Honor: Allied Assault—the first game I remember doing the iconic D-Day opener. This one stars a “Davis” instead, but that’s no big deal. 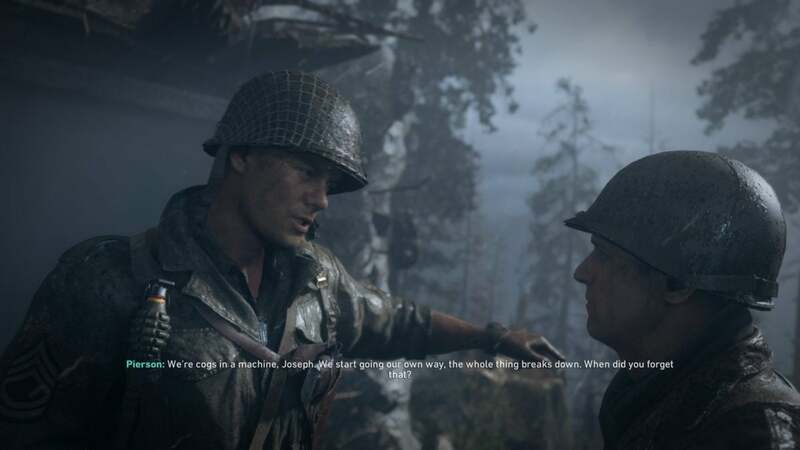 15 years on, Call of Duty: WWII is less “World War II as it actually existed” and more “World War II as it existed in video games between 1999 and 2008-ish,” a Greatest Hits Collection spanning from the original Medal of Honor through to Allied Assault, and eventually Call of Duty 1, 2, and 3. It was the decade where everyone got sick of World War II games, but absence does indeed make the heart grow at least a little fonder. “Everything in moderation” is not the games industry’s strong suit, which I guess is why we tend to get ideas in waves. We do sci-fi to death in the ‘90s so everyone moves on to World War II. Then we do World War II to death so we move on to modern war. That gets stale, we return to science fiction. And voila, 15 or 20 years later we’re reloading our M1 Garands. And if Call of Duty: WWII is the start of a World War II renaissance, it’s about the safest bet you could make. 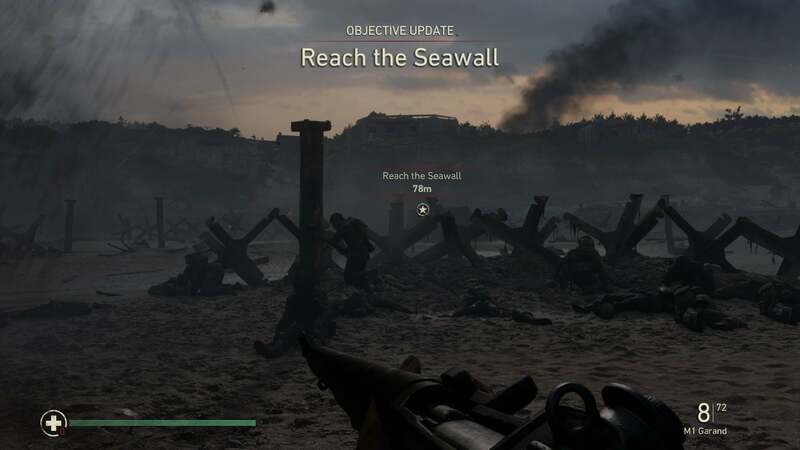 Dredging up the ol’ D-Day to VE-Day storyline once again, from June of 1944 through to April of 1945, it’s the same Band of Brothers/Saving Private Ryan story video games love to focus on. We’ve seen it in Allied Assault, in multiple Call of Duty games, in Gearbox’s underrated Brothers in Arms series, and so on. So if you played games between 1999 and 2008ish, this’ll feel very familiar. Omaha Beach? Check. Normandy’s hedgerows? Check. Hill 400? Check. Battle of the Bulge? Check. All the usual highlights. Pierson is the absolute worst when it comes to hoary old “soldiering life” cliches. The difference of course is that we’ve had a dozen or so Call of Duty games and a generation (or two) of hardware since last we saw these locales. Call of Duty: WWII is stunning. It’s a case, as with remasters, of a new game looking like I remember the old, not how it actually looked. Sprinting between hedgehogs on D-Day, the water bursting around me, the plink-plink-plink of a German machine gun tapping on barricades, then up and over the earthworks, storming the bunkers full of Nazis—it looks like I remember Allied Assault looking, brings back that same adrenaline rush. Then I look at how Allied Assault actually looked and…oh. Pictured: Definitely not Allied Assault. The same is true of Hurtgen Forest and the rest. Ideas that were only hinted at in the past can now be fully realized—for instance, the way artillery shreds a 50-foot pine tree, turns it into six-inch chunks of shrapnel. Trees (and limbs and houses and so on) explode in WWII in a way they didn’t and couldn’t in 2005. Maybe that’s enough. 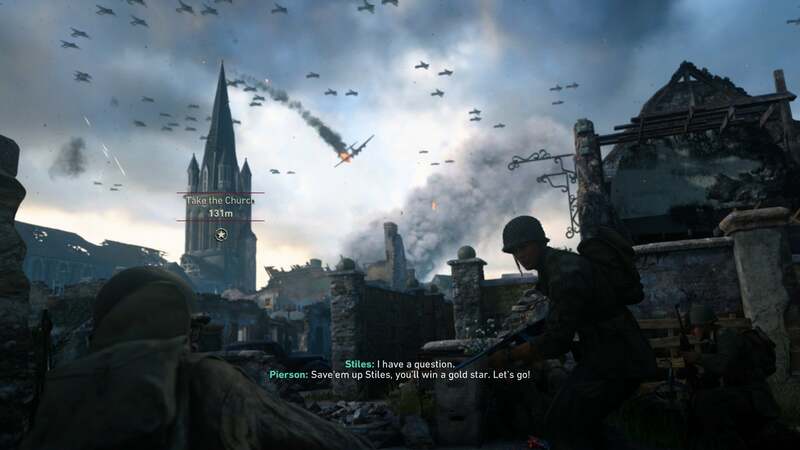 Technological advances perhaps highlight how little Call of Duty’s progressed in other respects, but only to those who were here for the World War II game glut the first time around. There’s an entire new generation of people playing games now who’ve never played something like Call of Duty: WWII. And for those of us who were there, the nostalgia is still real. Hearing the ping of an emptied M1 Garand, seeing that familiar gray-green color grading, hearing the rumble of Panzers coming over a hill—I missed it. Side note: WWII also features Call of Duty’s best behind-enemy-lines stealth mission since Chernobyl. Hell, Sledgehammer’s even taken this throwback one step further, eschewing rechargeable health in favor of medkits—the first time since Call of Duty 2. 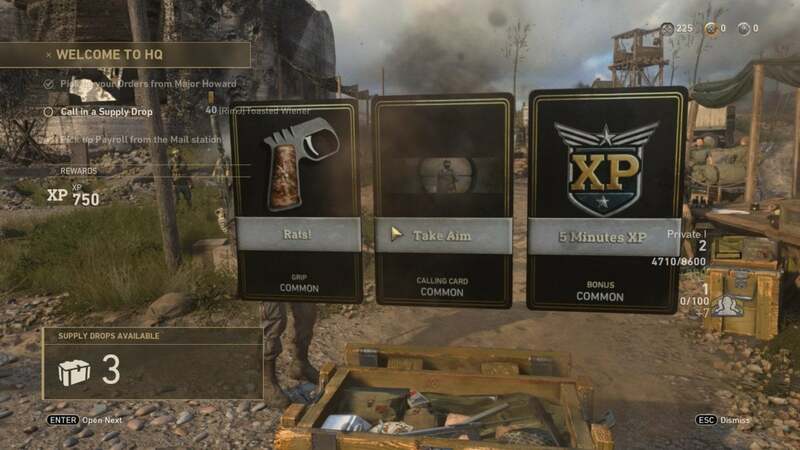 In terms easier to grasp, that means it’s the first time Call of Duty has used medkits for health since before the release of the Xbox 360. Multiplayer feels just as retro, at least by 2017 standards. I don’t typically spend much time talking about Call of Duty’s multiplayer, in part because the last few iterations just haven’t appealed to me much at all. But I found myself playing and actually enjoying WWII over the weekend in a way I haven’t since maybe... Black Ops? It’s pretty simple, really. Call of Duty: WWII ditches all the wall-running/jump-boosting/future-parkour stuff from the last few entries. Sledgehammer’s been fond of yelling “Boots on the ground!” in its marketing pitches and while I hate to regurgitate marketing points, I can’t deny I’m having more fun with my two feet planted pretty firmly on Europe’s war-pocked soil. And I just prefer WWII era weaponry. It’s what drew me to Battlefield 1 last year (where the weapons were even more primitive), and it’s what’s kept me playing WWII so far. That aforementioned M1 ping is a classic, but the clunky mechanical feel of the period is overall a big draw. There are aspects I definitely don’t like. One of the most surreal moments I’ve had in 2017 was popping open loot boxes while some random dude commented over my shoulder on the items contained therein. “Three commons? Oh you got screwed, man.” See, WWII has a Destiny-like hub called “Headquarters,” styled after a Normandy Beach base of operations. It’s like a pseudo-MMO with fellow players running around emoting at each other, marking challenges to complete in their next match, and—yes—popping open loot boxes in full view of everyone else. But aside from Headquarters, the logistics of which made WWII’s servers a bit of a nightmare over the weekend, this is pretty much stock Call of Duty multiplayer. 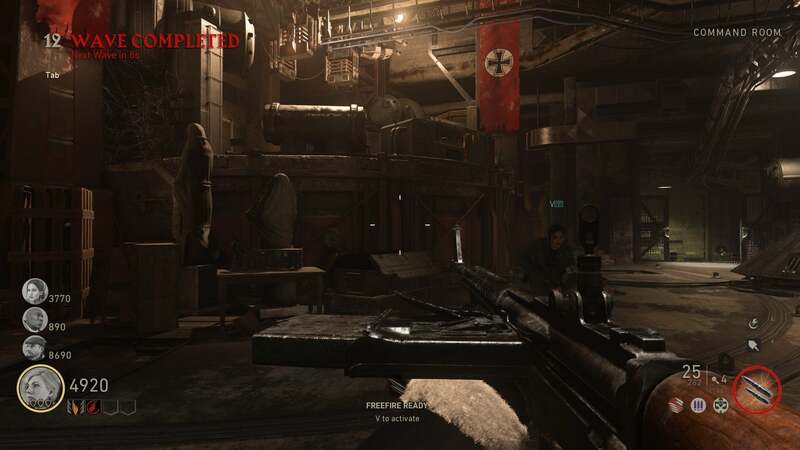 You can even unlock reflex sights and other modern warfare gizmos for your circa-1944 weaponry. It’s dumb but it’s my kind of dumb, I guess—at least until Battlefield makes a World War II game again. As for the now almost decade-old Zombies mode, it’s probably the weakest part of 2017’s offering, which is surprising since it was the part of Infinite Warfare I enjoyed most. WWII ditches the zany tone of last year’s “Zombies in Spaceland” for a more classic Nazi Zombies feel, darker and more ominous. And that’s fine in theory, but the zaniness helped mask some of the repetition. 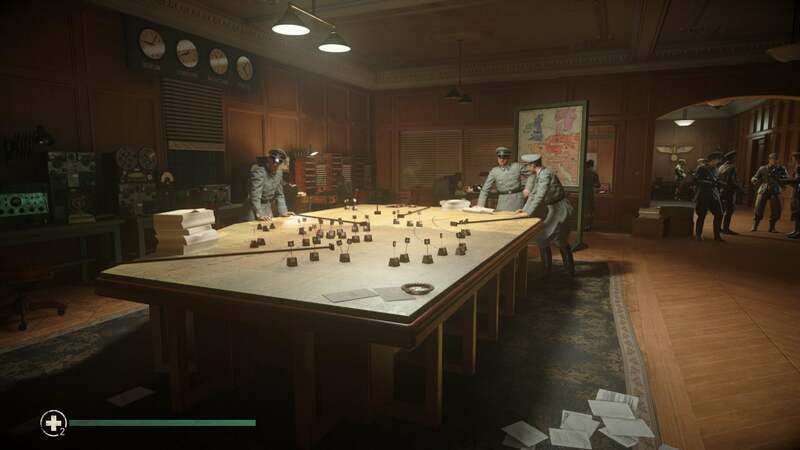 I’ve played WWII’s zombie campaign three times and while it’s a similar labyrinth of unlockable doors, collectible weapons, and bizarre traps, it just lacks a certain spark. Part of the problem I think is that the zombies feel spongy, which clashes with WWII’s weapons. Shooting a Nazi Zombie with a chunky World War II-era combat shotgun only for it to shrug off the blow and keep coming at you? A bit of a cognitive disconnect. Regardless, it’s a drag and I don’t see myself going back much, especially given that the proper multiplayer mode’s been somewhat redeemed. Nostalgia is fine. Nostalgia is good. I enjoyed my time with Call of Duty: WWII and I’m continuing to enjoy its multiplayer off-and-on. But nostalgia is also weird—a strange and uncontrollable force where you know what you’re playing is somewhat mediocre, somewhat disappointing, and you just don’t care because you grew up shooting virtual M1 Garands and it feels good to shoot one again, to hear that ping and see some dumb Nazi’s helmet pop off. Call of Duty: WWII is mediocre. I enjoyed it anyway. 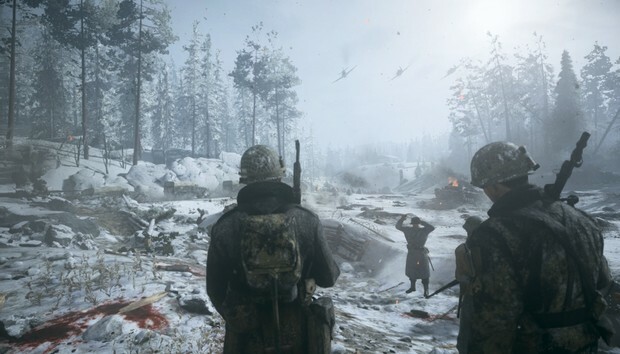 The question now, of course, is whether 2018 brings Call of Duty: WWII Pt. Two. I’m fine if it does, but the series can’t just coast along on another Greatest Hits Collection next year—it needs to take some actual risks, dig a bit deeper. We can’t just do Band of Brothers forever, especially if our characters can’t be one iota as interesting as even the least interesting character in Band of Brothers.